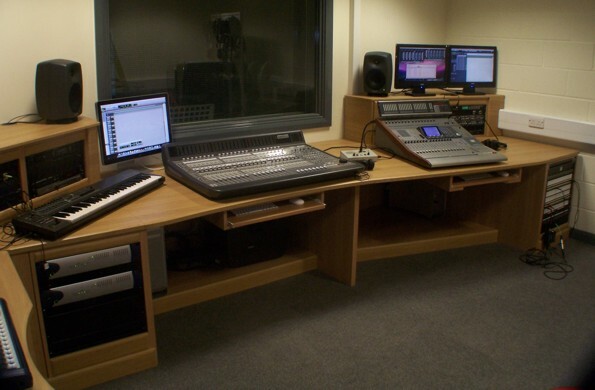 We have completed the design of numerous sound recording studios in both the education and professional sectors. Our consultants have extensive experience using and designing audio sound recording studios utilising both analogue and digital systems. In the education sector we aim to incorporate both analogue and digital systems into the design should the budget allow as this enables the student to start off with basic analogue sound recording so they can understand the basic principles before moving on to digital audio mixers and full ProTools computer based audio recording and editing. Most of our studio designs incorporate custom built recording studio furniture firstly to keep the equipment, cables and connections all neatly housed, but also to provide a professional look and feel to the space. All packages include full training and after-care support.